3/18/2011 - Double strike can be a no-brainer for a legend that represents a pair of creatures that fight as a team. Looking to the black side I was drawn to a semi-vampiric ability that would interact in a cool way with the double strike. From there I had to decide whether The Brothers Grim would only grow when they damaged a creature, a player or both and how to deal with potential confusion issues. 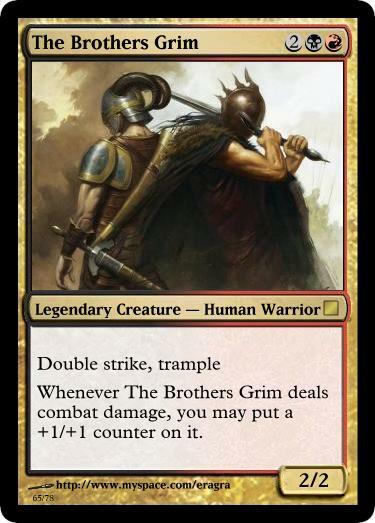 If The Brothers Grim are blocked by a creature destroyed by its first attack, will it be clear that, without trample, they still wouldn't deal damage to the defending player? Giving them trample—even though it's not primary in either color—totally prevents that confusion. If the growth triggers on damage to a creature but not to a player, will it be clear that it doesn't trigger again during the regular damage step? 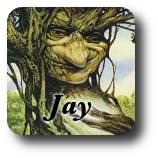 If the growth triggers on damage to a player but not to a creature, does the card feel anemic at 4 mana? Does the trample then feel cheaty, making chump blocks irrelevant? I'm pretty happy with the final solution. They always get bigger and are always a beating. I think this is perfectly fine. Those issues shouldn't come up than any other creature with double strike. Being a rare it's unlikely to be a point of contention with someone unfamiliar with the basic rules like that. I think I'd actually prefer it without trample, with a CMC of three. That weakens its potential for growth and sheer damage but is a bit more exciting, I think. Either way would be a pretty neat card. I really like trample and double strike, but... I think he should only trigger when hitting players. The reason is extremely aribtrary: when I read his ability, I just expect it to say "to a player" because we so rarely see just "deal combat damage" as a trigger. It's a bizarre exception and it reads weird to me. However, I'm sure in a set with perhaps a cycle or similarly triggering creatures, or maybe even without, after a few goes I'd immediately get used to it. It's a very nice card indeed. I absolutely love this card, minus one part. I would want to remove the combat damage part - if you stick an equipment on it that lets it ping people, that should still work I think. Your first two sentences confuse me greatly. By that logic, shouldn't all creatures with double strike also have trample?